Athletics prove time outs are critically important. The mark of great coaches is having the skill to take the complex and make it simple. The mark of a gifted athlete is making a very difficult skill look easy to perform. Taking time outs in sports is a difficult skill to master. Inexperienced coaches often fail to maximize the use of time outs. This hinders their team from being successful. Team needs a mind rest! Confusion, poise, or confidence needs to be restored. Team needs a special play in a crucial situation. Team is exhausted. They need a rest. As a marriage and family counselor in the 1970’s, Time Out Education was a key learning experience for my clients. Communication is fueled by anger. Heart beats exceed 84 beats per minute. Time to call time out. Exhaustion. Everyone is tired or hungry. A time out is in order. Confusion and chaos! Typically one person is better with words and quick responses while others need process time. I call this sword fighting with the tongue. The tongue master doesn’t want a time out. The other person needs a time out. Life is hard. Illness, job loss, bad news, loss of life etc. may need many time outs. If one of us calls time out it is the rule; no debate. Time is out, discussion ceases. 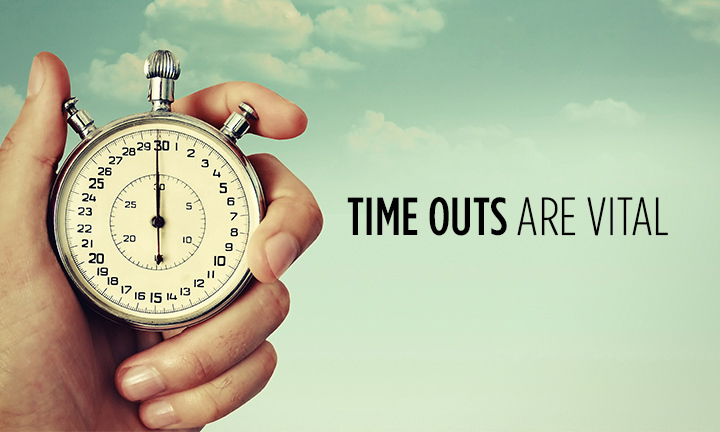 The person who called time out is the person who calls time in. (May take from minutes to days). Mutual commitment to eventually resolve the reason the time out was necessary. Time in must be called at some reasonable point in time. In John chapter 17 the Lord Jesus Christ offers His last prayer before the cross. Our unity in family, in teams, in businesses, and in community give evidence to the reality of the Christ message. Homework: Be a great team player today, starting with the most important team; home.